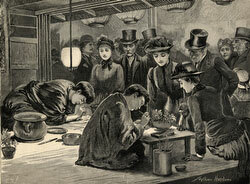 On January 10, 1885 (Meiji 18), The Japanese Village exhibition in London was opened to the British public. It resembled a traditional Japanese village with a tea-house, a Buddhist temple, and some 100 Japanese inhabitants, including 26 women and children. The exhibition showed Japanese textiles, pottery, wood-carving, lacquer-work and inlaid metalwork, wrestling and martial arts. The opening was attended by Sir Rutherford Alcock (ラザフォード・オールコック, 1809-1897), the first British diplomatic representative to live in Japan (1858-1864). Organized by Tannaker Buhicrosan, an entrepreneur who had spent time in Japan and whose wife was Japanese, the exhibition was held at Humphrey’s Hall in Knightsbridge, one of London’s most fashionable shopping streets at the time. On May 2, 1885 a fire destroyed Humphrey’s Hall and all the Japanese structures. One of the Japanese inhabitants died. The exhibition was rebuilt—with the addition of a concert hall and a bridge spanning a pool—and restarted in December of the same year. Coming at a time when there was immense romantic interest in Japan, which had opened its doors to the outside world only in the late 1850s, the exhibition was extremely popular and attracted over a million visitors. However, interest eventually waned and the village closed in June 1887 (Meiji 20).